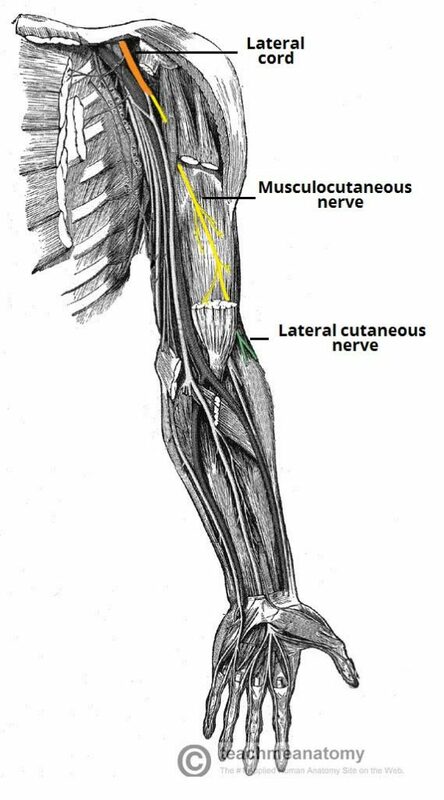 The musculocutaneous nerve is a major peripheral nerve of the upper limb. 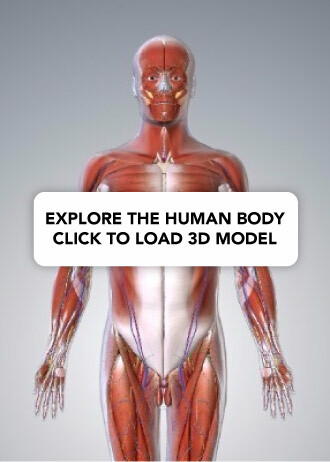 In this article, we shall look at the anatomy of the musculocutaneous nerve – its anatomical course, motor and sensory functions, and its clinical correlations. Motor functions – muscles in the anterior compartment of the arm (coracobrachialis, biceps brachii and the brachialis). Sensory functions – gives rise to the lateral cutaneous nerve of forearm, which innervates the lateral aspect of the forearm. The musculocutaneous nerve is the terminal branch of the lateral cord of the brachial plexus (C5, C6 and C7) and emerges at the inferior border of pectoralis minor muscle. It leaves the axilla and pierces the coracobrachialis muscle near its point of insertion on the humerus. It gives a branch to this muscle. The musculocutaneous nerve then passes down the flexor compartment of the upper arm, superficial to brachialis but deep to the biceps brachii muscle. It innervates both these muscles and gives articular branches to the humerus and the elbow. The nerve then pierces the deep fascia lateral to biceps brachii to emerge lateral to the biceps tendon and brachioradialis. It continues into the forearm as the lateral cutaneous nerve and provides sensory innervation to the lateral aspect of the forearm. Note: The musculocutaneous nerve is well recognised to have a varied anatomical course. It can interact with the median nerve, adhering to the nerve and exchanging fibres. In addition it may pass under coracobrachialis instead of through it, and/or may pass through biceps brachii. Fig 1 – The anatomical course of the musculocutaneous nerve. These muscles flex the upper arm at the shoulder and the elbow. In addition, the biceps brachii also supinates the forearm. A useful mnemonic to help you remember these muscles is BBC. This nerve initially enters the deep forearm, but then pierces the deep fascia to become subcutaneous. In this region, it can be found in close proximity to the cephalic vein. The lateral cutaneous nerve of forearm innervates the skin of the anterolateral aspect of the forearm. Fig 2 – Cutaneous distribution of the musculocutaneous nerve. The musculocutaneous nerve is well protected within the axilla, and injury is uncommon. Characteristic mechanisms of injury include penetrating trauma to the axilla (e.g. stabbing), and iatrogenic injury during the deltopectoral approach to the shoulder as a result of heavy retraction. Motor functions – coracobrachialis, biceps brachii and brachialis muscles are affected. Flexion at the shoulder and elbow are both weakened but remain possible as a result of pectoralis major and brachioradialis respectively. 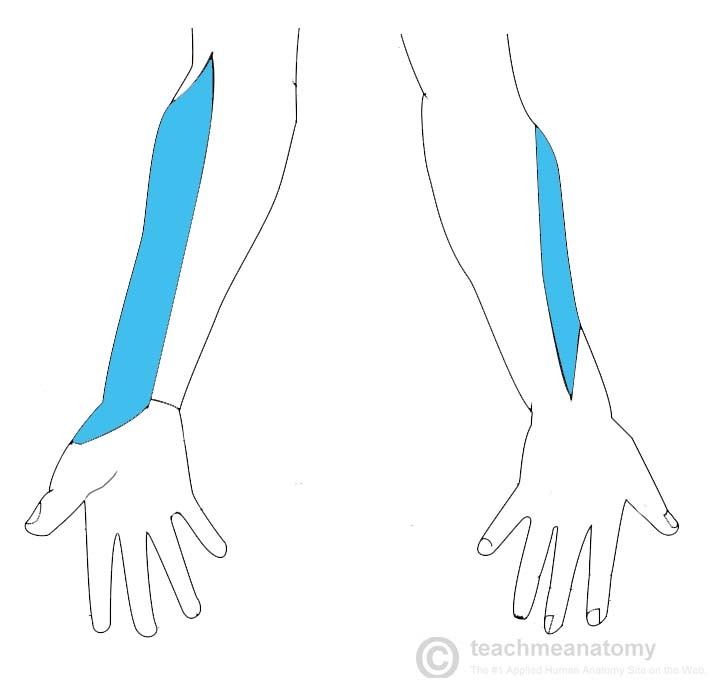 Brachioradialis also enables supination alongside the supinator muscle – so although weak, it is still possible. Sensory functions – loss of sensation over the lateral side of the forearm. A patient suffers iatrogenic musculocutaneous nerve palsy following a shoulder arthroplasty. Which of the following movements will be unaffected? Below is an illustration of the brachial plexus. Which letter indicates the musculocutaneous nerve?